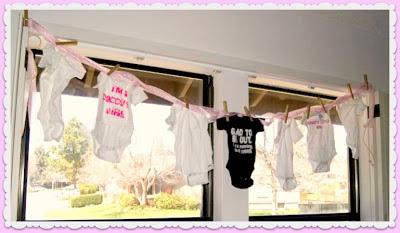 Today, I am going to give directions for making this really cute Onsie Baby Banner for a Baby Shower. It was pretty easy to do, and it came out so cute. I got a lot of ideas from Pinterest, here is a link to my Baby Shower Board, with my pins and the pins that inspired me. 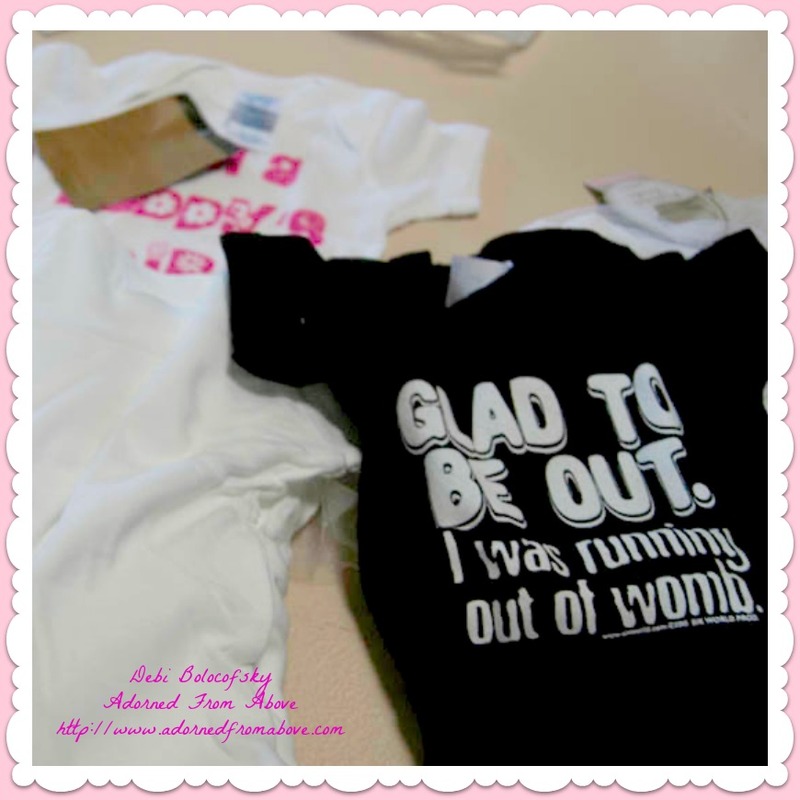 I had pinned a onsie that said, "So Glad to be Out, I was running out of womb." and Gabi and I decided that should be the centerpiece of the banner. When I was on Amazon.com shopping for the onsie, I saw 2 others with tutus. One said, "I'm a Daddy's Girl" and the other said, "Mommy's little Girl". I thought they would be really cute on the banner also, along with the plain onsies. Gabi and Laurie were so wonderful. They took the pictures that I had pinned and the materials that I bought and brought what was in my head to life. They are wonderful friends and family. We laid the onsies out on a table to see what we were working with. Then, Laurie and Gabi laid cute the twine so that it was long enough to hang over my window and drape down the sides about 1 1/2'. They then cut the ribbon to the same length as the twine. My ribbon had pink and white stripes and the other said It's a girl with a baby carriage on it. The put the ribbon in front of the twine. Next, they centered the black onsie in the center of the ribbon and twine and used the clothes pins to attach the onsie to the twine and ribbon. They, added the other onsies to the twine anchoring them with the clothes pins. Then we used a clothes pin to hold all of the ribbon and twine together about 1 1/2 feet from the end on each side. We then used two tacks on each side of the clothes pins to anchor the banner above the window on each side of the window. You now have a finished Onsie Baby Banner. I think this banner came out so cute and it looked great above the desert table. I always love hearing from you.